2010 April – The Nuge. If historical movies have one thing in common, it’s that they’re always historically inaccurate, often wildly so. In his latest film, British director Neil Marshall has avoided this recurring problem by making the whole damn thing up. Well, not exactly; Centurion is based on the myth of the 9th Legion, a unit of the Roman army which – so the legend goes – marched into tribal Scotland to conquer the last untapped stronghold of Roman Britian…and were never heard of again. As Marshall has acknowledged, historians have since found evidence to the contrary, but for the purposes of this film, it’s far more entertaining to ‘print the legend’. Marshall has clearly enjoyed the creative freedom afforded to him from fabricating a tale which has very little historical record, detailing how the best organised army in all the world could have just disappeared: by being ambushed and annihilated at the hands of the merciless Picts, the dominant Scottish tribe of the time. Out of this ambush comes six intrepid survivors, who must trek across the Caledonian mountains to escape the ruthless pursuit of the indigenous warriors. The result is a boisterous, tightly paced chase movie, like those popular in the seventies, where story takes something of a back seat to brutal, uncompromising action. It’s difficult not to address the spectre of Gladiator when discussing a Roman-set movie; Ridley Scott’s 1999 epic is widely credited as reviving the long dormant swords-and-sandals genre, making history (or at least cinema’s bastardised version of it) cool again. It’s an obvious influence, but Marshall’s film has none of the gloss or scale of Scott’s, nor the rich, impressive CGI realisation of ancient Rome. 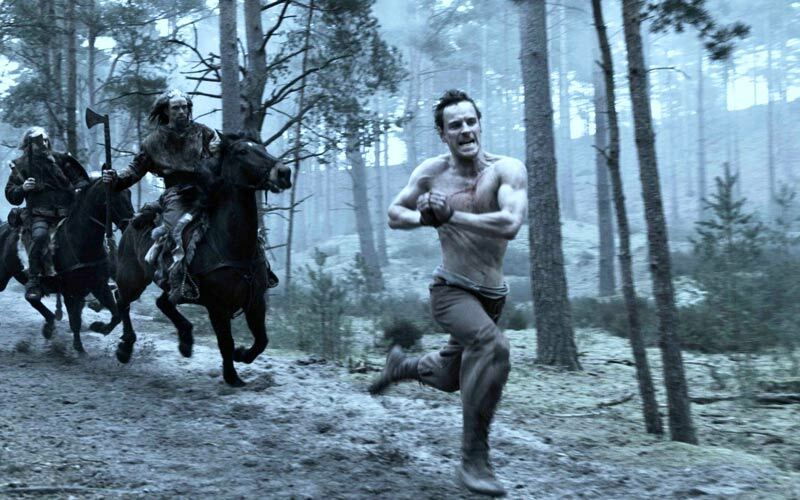 His is a cold, gritty, uncaring vision of Roman Britain, shot almost for real in the harsh Cairngorms winter, a minimum of computer graphics, many of the stunts being performed by the actors themselves. Less ‘swords and sandals’, more ‘mud and boots’. Marshall’s approach has more in common with Zac Snyder’s 300 – both gleefully eschew the history books, both are unflinching in their depictions of violence and gore, and both feature impossibly chiselled men as their warrior heroes. Here, though, it seems a little less ludicrous and homogeneous as 300‘s assortment of male models. Michael Fassbender, as the leader of the Roman survivors, and Dominic West, as the legion’s General, have just the right hulking, powerful physicality to convince you they were warriors in an ancient civilisation. Crucially, both have the acting chops to match, and they ably give their respective characters a much-needed depth. Fassbender imbues his Centurion Quintus with a war veteran weariness and an intense seriousness in his responsibility as leader. West, too, is impressive; much like his character in The Wire, he has fun as the reckless, hard-drinking but respected General, frequently indulging in a bit of anachronistically modern swearing, Deadwood-style. The rest of the ensemble are a mixed bunch. David Morrisey is always good value and gives an appropriate everyman turn. Noel Clarke, meanwhile, doesn’t seem to fit, and his attempt at a posh British accent – which, if movies are to be believed, is how the Romans spoke – borders on the laughable. Plus, the inclusion of Clarke and Riz Ahmed, as the skilled fighter Tarek, makes the common cinematic error of characterising ancient cultures as blanketly tolerant of all races. Incidentally, said forests make up the best aspect of the film: the mountainous landscapes of Scotland are stunning, shown off in a series of crane and helicopter aided sequences that loudly echo the centrepieces of New Zealand’s similarly impressive Lord of the Rings establishing shots, and credit must go to cinematographer Sam McCurdy for his efforts. Helped by historical enactment groups playing the doomed Roman army, McCurdy provides pretty authentic visuals, even if the set design occasionally feels slightly let down by a small budget. But visuals is probably where authenticity ends with this film; it’s a modern action pic in a historical setting, a thriller not unlike Marshall’s previous offerings, and with it comes the baggage that action films often have – the adrenaline addiction that sidelines story, the clunky expositional dialogue, the too-often predictable plotlines. Centurion is certainly more exciting and entertaining than any history lesson, and it’s a brave and welcome approach to make a bit of history up, but it could benefit from a little more substance. Fresh from vamping it up in the absurdly popular Twilight movies, the young British actor’s choice for his first big non-bloodsucking leading role was always going to attract wild attention. And then early PR for Remember Me, which opens in the UK today, suggested a new, more mature direction for the heartthrob. Could the overwhelming fame of the SMA (Sexiest Man Alive, of course) potentially overshadow the merits of what would otherwise have been an artful, overlooked indie film? As it transpires, there’s not much danger of that. Remember Me is a middle-of-the-road post-teenage melodrama which plays well to Pattinson’s young female target audience, and is being aggressively marketed as such. Commiserations must go to Pattinson’s co-star and Lost alumni Emilie de Ravin, who is practically hidden in most of the posters. Even if she were wearing a high-visibility jacket and clown makeup, it would be hard to steal focus. This is, indisputably, an R-Patz vehicle. Pattinson plays Tyler, a precocious 21-year-old college student with a distant father, a deceased brother and a reckless habit of general rebelliousness. Tyler is counterpointed by romantic interest Ally, who has also experienced tragedy in her family. Ally’s father happens to be a New York City cop that Tyler got into a scuffle with, and Tyler’s best buddy bets him to date her, initiating the relationship-based-on-a-bet story arc that comes to a head right on cue at the end of act two with inevitable dialogue like “but then I got to know you…” For the most part, it’s rigidly, obstinately formulaic. Boy meets girl, boy loses girl, boy gets girl back, nothing smarter than that. Tyler is an amalgamation of young movie angst, from James Dean to The Breakfast Club and everything in between. Whereas in the Twilight ‘saga’, Pattinson is emo-moody, here he is angry-moody: angry with his rich, detached father (in an unusual turn for Pierce Brosnan); with his little sister’s bullies, with the cops, with, it appears, the whole world. His hissy fits aren’t expanded with any great depth beyond the usual stock introspection (Tyler enjoys quoting Ghandi). Nor do they lead to any learning curve or consequence for the character, who has his wealthy father bail him out of prison on numerous occasions. But say what you like about the ‘saga’ – and this website certainly has – the boy can act. While the more ludicrous acts of rebellion do veer towards the histrionic, Pattinson shows promise of being a decent leading man who can construct a well-rounded performance, even if his preposterous handsomeness is distracting to all audiences, male or female. Emilie de Ravin as Ally has less to offer, mainly because she has little to work from. Her character is the usual feisty, kooky independent woman beloved of indie scriptwriters. One of her quirks is that she eats the pudding before the rest of her meal because “I don’t see the point in waiting.” The script is littered with infuriating dialogue like this, going for shallow pithy contemplation in favour of any great depth. “I’m undecided,” Tyler says in one scene. “About what?” asks Ally. 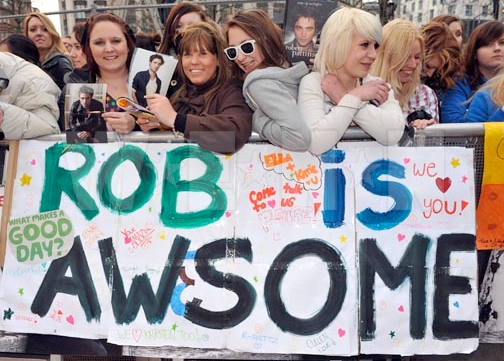 “…Everything.” The R-Patz teenage fanbase will squeal with delight at that one. And so we have another run-of-the-mill romantic drama, or at least we would were it not for the last curious fifteen minutes of the film. At this point I should act responsibly as a reviewer in warning you that there are spoilers forthcoming. Being a visitor to this particular website, however should mean you are an intelligent, discerning moviegoer who chooses carefully how you spend your money on the films you see, and so I really shouldn’t be spoiling anything. Just as the film comes to its natural conclusion, the boy has got the girl back, somewhat reconciled with his father and feels a bit less angry with the world, he goes to visit his father’s office on the fifteenth floor of what is revealed to be the World Trade Centre, on September 11th, 2001. And that’s it. End of film. No more Tyler. Apart from the occasional hint, there is nothing to prepare you for such an abrupt and surprising ending. The screening I attended elicited audible snorts of perplexed laughter when the date is finally disclosed; I overheard a ‘how absurd’ from an audience member. And it is. It’s not that 9/11 shouldn’t dramatised – there’s no reason why it shouldn’t. But to work a real-life tragedy so late into an otherwise average film seems exploitative; not just to the tragedy itself, which is used merely as a handy plot device, but to the audience who have supposedly invested in the story and characters only to have the rug swept away from under our feet for a messy attempt at Grecian tragedy finish. The closing minutes are admittedly moving, but only because it evokes the powerful memories of the event itself. Capitalising on a tragedy is not a classy way to make films. But undoubtedly I’m preaching to the choir here. This is a Robert Pattinson showcase, and in that respect it fits the bill just fine. Remember Me will be remembered only as another step on Pattinson’s relentless climb to omnipresent fame. His fanbase is ardent, adoring, young, naive, vast in numbers, uncaring about filmmaking of any great distinction and ever-yearning to see his ‘troubled youth’ schtick. An actual comment from the trailer on YouTube reads: “Just saw this movie﻿ yesterday and WOW its really the best Robert Pattinson’s movie eveeeeeeeer !!!! after watching it i want to watch it like 1000 times more !! !” With an audience like that, one negative review will hardly make an impact. R-Patz is in town, and he’s here to stay, like it or not.